Lottie‘s original seats were not ideal. The slats were too far apart for comfort. And the cross pieces holding the slats together were not at the ends of the slats. So when you stepped into the fore or aft end of the cockpit the seats flew up into the air, like a rake. They were also wearing thin and deteriorating after many year’s use. These were replaced by wider iroko slats for greater comfort. The cross pieces holding them together were set at the ends for greater stability. So far the iroko has been left untreated – just scrubbed with fresh water from time to time. It has lost the nice honey colour of new iroko. 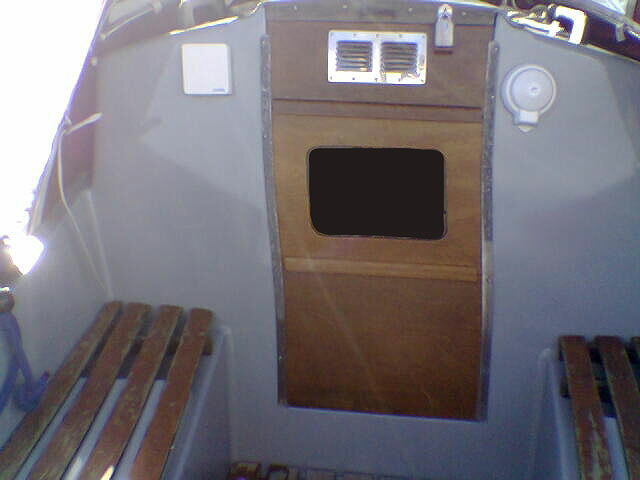 The slats were bolted to the locker hatches and cut into three sections to enable the middle part to hinge open. About half the back edge of the grp hatch cover had to be removed to enable it to clear the locker coaming. The short ends of the seats were secured with aluminium brackets and butterfly nuts to allow them to be easily removed for cleaning underneath.